We’re not afraid to be a little hippity-dippity up in these parts. I took a meditation for childbirth class (although my birth experience was a little too crazy to actually do any deep breathing! ), and we’re all about being open to different ideas and philosophies, especially when it comes to parenting. So when The Enlightened Mom landed in our inbox (the digital version, not the actual book), I was intrigued. And interested. 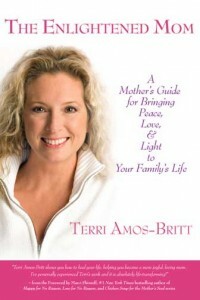 The Enlightened Mom, by Terri Amos-­Britt, is a guide to empowering yourself, with a fundamental tenet being that you must take care of yourself before taking care of others. Because this is something I struggle with daily, parts of the book really resonated with me. Putting yourself on the backburner doesn’t help you or your family. Feel guilty for working out of the home? If it makes you a better mom, so be it! No need to feel guilty about it. Guided meditations accompany the book, and while I didn’t try these, I’m sure they would add another level to your self-help progress. The book’s message really embodies what we’re all about: That you’re not perfect and you shouldn’t be perfect or try to be the “perfect mom.” You’re you, special and unique, and that’s enough. I don’t know where this pressure to be perfect comes from—I’ve always been a bit of a goody-two-shoes, even as a child—but I’m definitely learning to accept my flaws. If you’re the same way, this book might be the guide you need to take off your perfection pants (I just made that up). While you may or may not be down with the spiritual aspect of the book, the message to accept yourself, imperfections and all, should be the philosophy of moms everywhere!